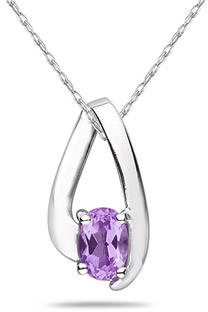 Sleek white gold loops around to embrace an oval amethyst as if floating in air. The pendant measures 16mm x 8mm and hangs from an 18 inch chain also crafted in 10K white gold. We guarantee our Amethyst Embrace Pendant, 10K White Gold to be high quality, authentic jewelry, as described above.